A pilot flying into New York and loses control of the plane which plummets but the pilot manages to regain control. Then a plane in London plummets and leaves 15 dead. No one can figure out what happened. Kate Page is a reporter for NEWSLEAD. She gets a message that the incidents were planned and that there will be another one worse than the last two. It’s a race against time as Kate finds herself trying to stop the next attack. Kate is such a strong female character. She rises to the challenge and works to help the terrorists instead of just reporting on the current events. There was lots of action and I couldn’t put the book down. I just had to find out what happened next. This is the first book of Rick Mofina’s that I have read. I’m sure if I read the other books in the Kate Page series I would have more background for Kate. 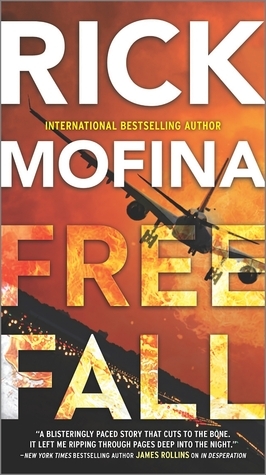 But I had no trouble reading Free Fall as a stand-alone book. If you are looking for a high energy thriller look no further. This is one book that I recommend you checking out. To purchase Free Fall make sure to visit Amazon, Barnes and Noble, Goodreads and Rick Mofina’s website. I received Free Falling for free from the publisher in exchange for an honest review.